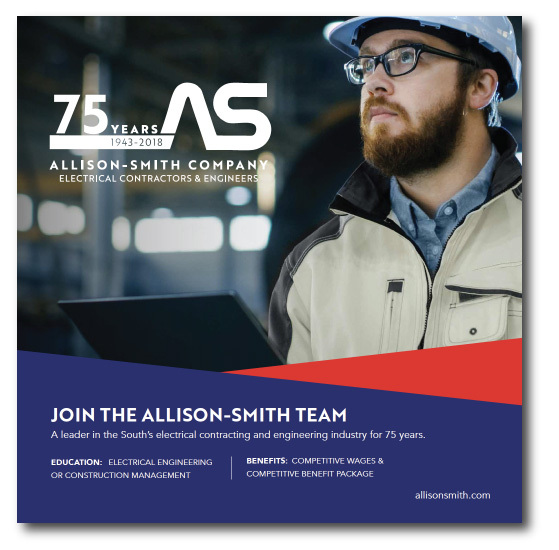 A leader in the South’s electrical contracting and engineering industry for 75 years. At Allison-Smith Company, we are proud of our reputation as one of the South’s leading electrical contracting firms. We work with many of the nation’s most influential corporations who rely on us for our specialized capabilities and our capacity to focus our in-depth resources on their projects. We take great pride in working hard, continually seeking to improve the company. Allison-Smith Company LLC provides our full-time employees with competitive compensation and offers a comprehensive benefit package. All applicants must successfully pass a drug test and a 10-year background check and have a valid state driver’s license or ID.